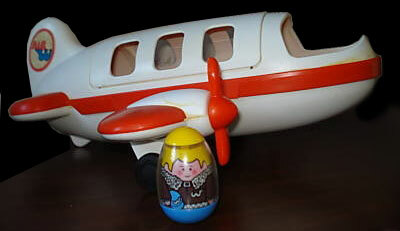 Description: Travel by land, on sea or in the air with the Weebles Weekender set. 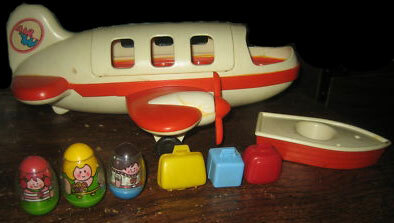 Includes a large jetliner, a sailboat, a car, luggage, 4 Weebles, and a Weebleville Map. Airliner (Large Plane) - HTW196 - Large white 5-seat plane with a RED stripe, RED side wings, and RED interior. The plane has 2 red (or blue) spinnable 2-blade propellers. The plane has a seat for a pilot in the front, 4 passenger seats in the middle, and luggage room in the back. Each side of the tail wing has an oval white, pink blue litho marked "Air W". Plane rolls on 4 black wheels (located under wings). Luggage room floor is marked "©1973 Hasbro®, MADE IN U.S.A.". 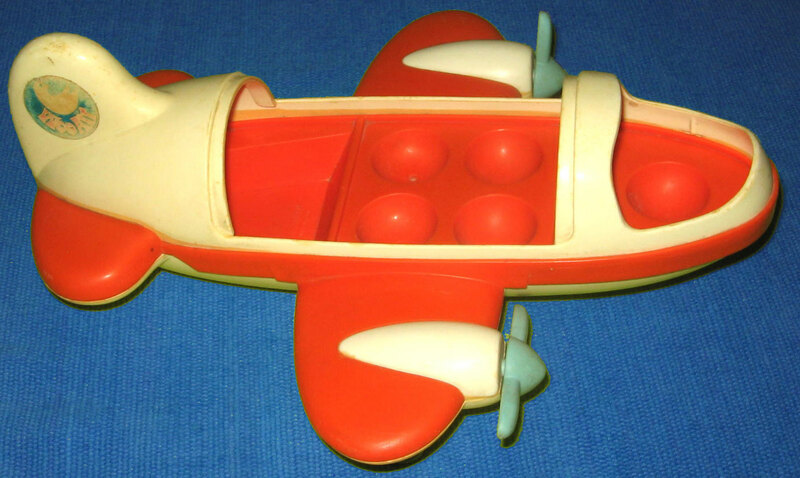 Bottom of plane is marked, "HASBRO INDUSTRIES, INC., PAWTUCKET, RHODE ISLAND 02861, TOY NO. 596". Measures 12" long x 10" wide x 4-3/4" tall. Airliner Roof - HTW177 - White rounded airplane roof with 6 "windows" and marked, "©1973 Hasbro®, MADE IN U.S.A." on the inside. Bottom edge (under the windows) has a groove to attach the roof to the airplane. Measures 5-3/8" long x 3-3/8" wide x 1-5/8" tall. Sailboat - HTW197 - Red 1-seat sailboat with a white top. The front top deck has a hole to attach a large white triangular sail (attached to long white flag pole) on top. Car - HTW198 - Small white 1-seat car with a red base. Rolls on 4 small black wheels. HTW180 - Yellow narrow rectangular suitcase with a snapping carry handle on top (bottom edge of suitcase is wider than top edge). The bottom edge of the suitcase has 3 hinges (often broken), and when the snap on the handle is opened, the suitcase opens. Inside the suitcase is marked, "©1973 Hasbro®, MADE IN USA". HTW181 - Red narrow squared suitcase with a snapping carry handle on top. The bottom edge of the suitcase has 3 hinges (often broken), and when the snap on the handle is opened, the suitcase opens. Inside the suitcase is marked, "©1973 Hasbro®, MADE IN USA". HTW182 - Blue wide squared suitcase with a snapping carry handle on top. The bottom edge of the suitcase has 3 hinges (often broken), and when the snap on the handle is opened, the suitcase opens. Inside the suitcase is marked, "©1973 Hasbro®, MADE IN USA". Weebleville Map - HTW199 - Paper tri-fold flier with picture of a weeble in a white car riding down a road. Top of tri-fold is marked "Weebleville". HTW12n - Pilot - Blue base, yellow top (hair) pilot figure with a brown jacket (big fuzzy collar), marked "w" on one side. He holds a blue cap with "W" in white on the bill. Measures 2" tall. HTW8n - Boy - Blue base, brown top (hair) boy with a white shirt, red belt, and a red "w" on his chest. Has a slingshot in back pocket and marked, "©1973 Hasbro". Measures 1-3/4" tall. HTW7n - Girl - Green base, red top (hair) girl with a green, pink, and white striped shirt. She has a red flower on her chest and is marked, "©1973 Hasbro" on the back. Measures 1-3/4" tall. HTW6n - Woman/Mom - Green base, yellow top (hair) woman with a green sleeveless shirt, yellow belt, and a bouquet of flowers in her hand. Marked, "©1973 Hasbro" on the back. Measures 2" tall. Featured in 1975 Sears Christmas Book (page 486) - Price $5.87.